This shop on a busy street is split testing, and you won't believe what they sell. A “split” is not usually considered a good thing in the world of prophylactics. However, a condom shop that is “split testing” is going to have happy customers and prosperous owners. I had the great pleasure of visiting Estonia and the Netherlands on a speaking tour. While in the Netherlands I stayed in a real 19th century windmill, hung out in an 18th century farm house, and walked by a condom shop housed in a 16th century building. There are a lot of old places in the Netherlands. I mention the condom shop because I discovered that this shop, called Condomerie® was split testing their store front. It begs an important question: if a condom shop in the red light district of Amsterdam is split testing, why aren’t you? We can get you started. While I was impressed that the Condomerie was split testing their products, I was just as excited about the number of condom jokes I could make in a blog post. The store front of the Condomerie was tasteful, consisting of two large windows separated by a door. In each window a selection of condoms were well-hung, having been blown up like a balloon to show off the size and shape. I found the collection of colorful condom most interesting. As you can see from the photo below, these condoms were animals, vegetables, soccer balls, skeleton heads… there was even a Eiffel Tower condom. You needn’t worry about size when you’re sporting the Eiffel Tower. And what says “I love you” better than a condom that says “I love you?” See them all in the picture below. Being a geek, my attention was drawn to an artificial condom made from laminated paper that contained a secret QR code. I call it a QR condom, or Qondom. Scott Stratten says that every time a QR code is used a kitten dies. However, you have to get creative when designing tests. Use whatever tools are at your disposal. I scanned it with my phone to see where it would take me. The URL contained a word my Dutch friend understood: “Right”. The Condomerie was split testing its windows! They had placed a Trojan Horse in the window designed to trap sightseers with smartphones. Their test placed the colorful cartoon condoms in the right window. I’m going to call this the right-brained window that’s creative, emotional and completely unconcerned that these condoms are far more intricate than necessary. On the other side were condoms arranged primarily by size. This is the left-brained, “just the facts” side of the store. You can imagine that those interested in this window would be looking for a calibration scale to ensure they got the best fit. The left window of the Condomerie is about size and fit. The right Condomerie window features colorful and whimsical condoms. Which window would you linger at? The left-brain, functional window? The right-brain imaginative window? Or, the window of the cheese shop next door? At this point, only the proprietors of the Condomerie know. A problem with this test is that only tech-savvy condom users with smart phones are going to be part of this sample. Those with feature phones and those who’ve never bothered to load a barcode scanner app will not be able to participate. This is a real problem, as it probably skews the results, inflating the sample toward early adopters. The sample taken wouldn’t be expected to represent the typical condom-buying public. There are some fundamental issues with the landing pages that may be suppressing conversions, but we can expect all marketing channels to improve as an organization learns from split testing. This shop is learning something about their tech-savvy audience, an audience who can often afford the more expensive condoms and profitable condoms. Revenues can be expected to rise when tested changes are rolled onto the shop floor. What are you learning about your website visitors? How are you testing your assumptions about what people want, like and are persuaded by? Testing is the most effective way to consistently increase your revenue. The Condomerie knows this and so should you. Let Conversion Sciences get you started on a website split testing program that will get more revenue from the traffic you already have. Get a free copy of my book if you are the first person to provide a correct count of the double entendre in this post. Put your number in the comments. 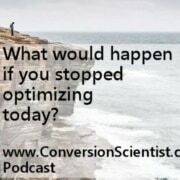 Brian Massey https://conversionsciences.com/wp-content/uploads/2018/11/conversion-sciences-conversion-optimization-agency.png Brian Massey2014-06-24 16:42:242014-06-24 16:42:24This shop on a busy street is split testing, and you won't believe what they sell. Great post Brian! And the Netherlands is a great country. I count eight (8) unique double entendre’ – there are, of course, multiple instances of some. You’re a little light, Dennis. This comment thread is going to get interesting. I really had better things to do with my time than composing this post – this is entirely YOUR fault! I count nine in your list. But you’re missing at least one. And I fixed the typos. Thanks. And “blown up like a balloon” and “sample taken” are too obvious, and “early adopters” is too obscure. Nope, no more … and don’t you DARE try to prolong this agony! a condomshop with happy customers. naturally! That one was an accident.